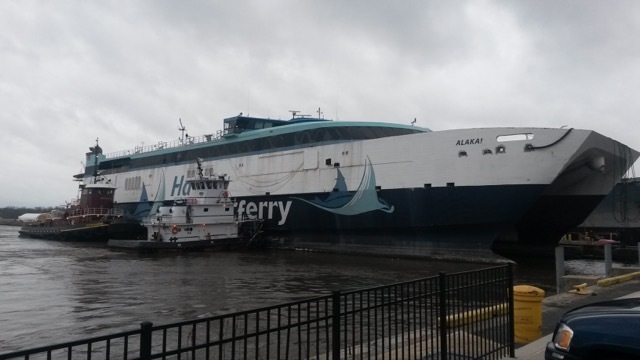 Illustration provided by Jacob Turgeon ’02: HSV Alakai, (The CAT) underway from Detyens Shipyard in Charleston, South Carolina to Portland, Maine as she embarks on her first season of the renewed international ferry service operated by Bay Ferries Limited. 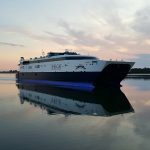 If you’ve visited Portland, Maine, lately, or glanced out to sea from many points along Maine’s midcoast, you may have seen the sleek catamaran passenger ferry recently acquired for the revived service between Nova Scotia and Maine. 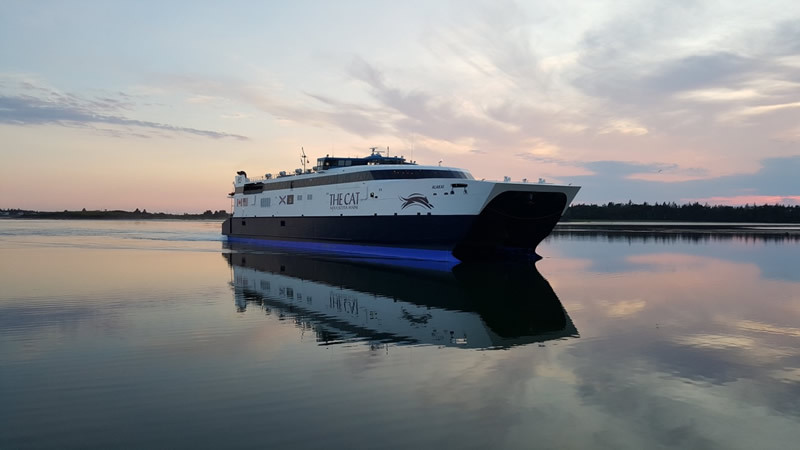 Since the spring of 2016, the HSV Alakai, commonly known and branded as the CAT, has carried nearly 135,000 passengers between Portland and Yarmouth, offering approximately 120 daily, round-trip voyages per season from early June to mid-October. 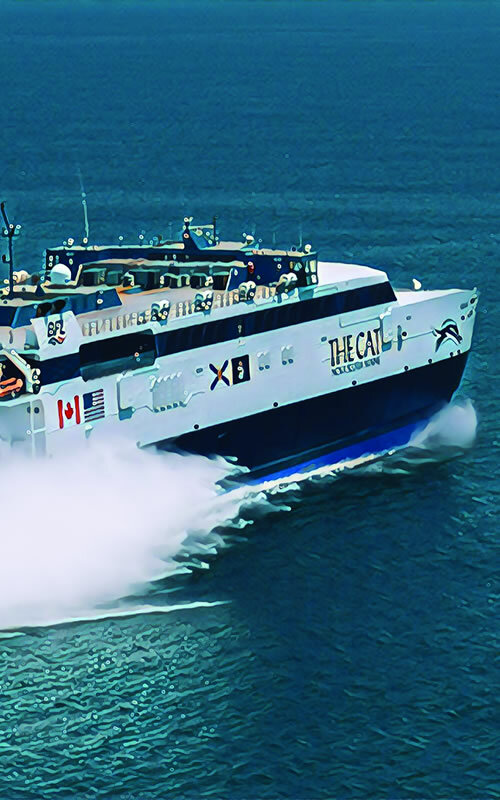 The CAT has many unique attributes, most notably her top speed of 45 knots, classifying her as one of the fastest passenger vessels operating in North America. Another, which may not be so commonly known, is that she is home to nine Maine Maritime Academy alumni, serving in a range of crew billets and collectively accounting for more than half of her marine department. Each MMA alum has his or her own story of the path that led to Alakai, and though all are different, they are equally interesting, much like the story of Alakai herself. Alakai was launched from Austal, USA (Mobile, Alabama) in April 2007. She was purpose-built to serve as an inter-island roll-on/roll-off passenger ferry between Oahu and Maui, deploying on her maiden Hawaiian voyage in August of the same year. The Hawaiian service, however, was short-lived, and operations were discontinued in 2009 due to various challenges, and both Alakai and her sister ship, Huakai, came under the ownership of the U.S. Maritime Administration (MARAD). Both were assigned a deployment to Haiti as part of the earthquake relief effort in 2010. In 2012, they were transferred from MARAD to the U.S. Navy. Alakai would then be known as the USNS Puerto Rico. For the next several years, the Puerto Rico remained in lay-up status in Philadelphia, Pennsylvania. The Navy kept the vessel manned with a reduced crew, sourcing personnel through Seaward Services, Inc., based in New Albany, Indiana. 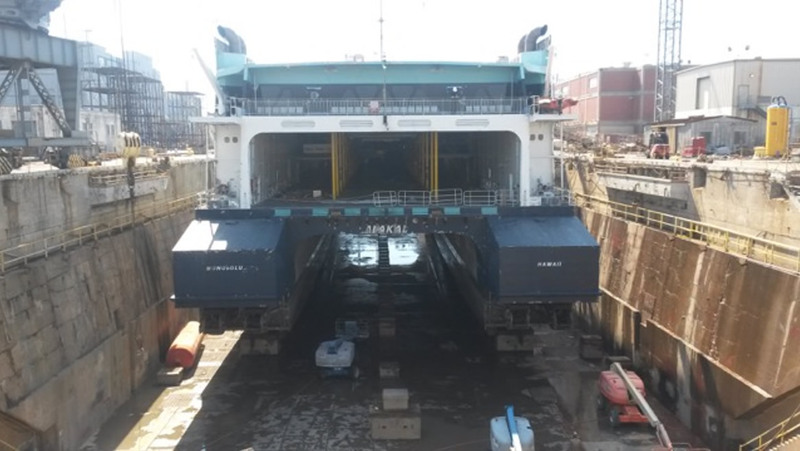 In early 2016, Bay Ferries Limited (BFL), a Canadian-based company and original operators of the former CAT ferry service from Portland and Bar Harbor, was in search of a vessel that would satisfy a new contract with the Province of Nova Scotia, providing passenger service between Yarmouth and Maine. 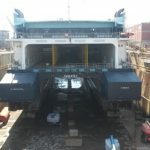 BFL had successfully operated multiple high-speed ferries from Nova Scotia to Maine from 1997 to 2009, eventually discontinuing the seasonal route due to high fuel costs and the economic downturn. After extensive processes and discussions, the U.S. Navy and BFL entered into a lease agreement that would utilize Alakai to offer the ferry service. 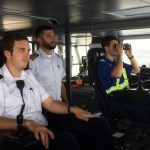 The vessel, capable of carrying some 750 passengers and 200 cars, would operate between the ports of Portland and Yarmouth at a service speed of 35 knots. 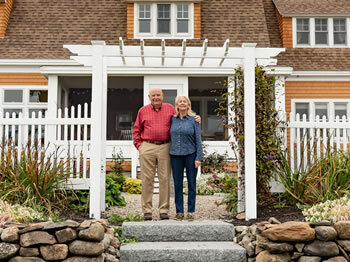 Reviving the ferry service had the support of the Province of Nova Scotia along with businesses and individuals in Maine, including Sen. Angus King and Rep. Chellie Pingree, who were instrumental in its renewal, BFL was optimistic it could once again provide reliable ferry service. This left the company in search of a vessel fit for the task. The Alakai was towed to Detyens Shipyard in North Charleston, South Carolina, in April 2016, where it was refitted, recertified, and reclassed, undergoing extensive repair and overhaul over eight short weeks in preparation for its service charter in the Gulf of Maine. The CAT enters Yarmouth harbor during the first days of her inaugural season in 2016. Since Alakai remained under U.S. flag, the officers and crew were required to be American citizens holding U.S. Coast Guard credentials. Seaward Services continued to provide crewing requirements to BFL, but there were fewer than a half dozen employees inherited with the ship. This left Seaward Services facing the challenge of sourcing officers and crew with a tight deadline. As all of the newly hired crew members would be strangers to the vessel, and most to the fast-ferry industry, there was a push to get the billets filled quickly to allow for a few weeks of ship familiarization and to complete the type-rating process. 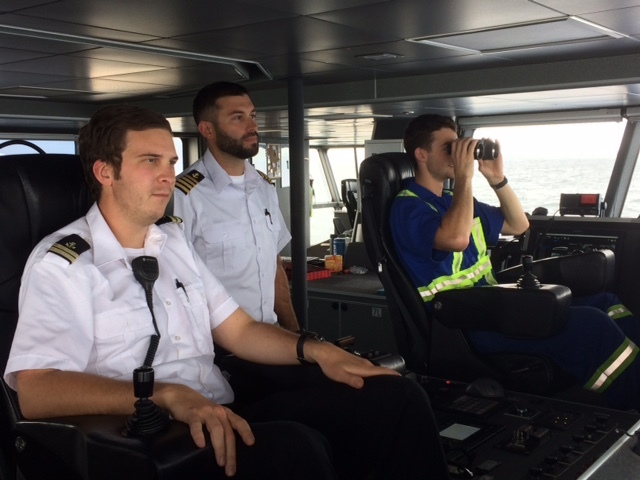 To become type-rated, every officer or prospective officer must complete a series of exams that evaluate safety, high-speed code, vessel particulars, damage control procedures, mechanical systems, and crowd and crisis management. 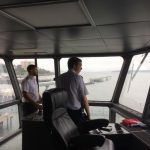 The exams, along with proof of the required day and night trips into each specified port of the route, are submitted to the U.S. Coast Guard for a supplemental qualification to each officer’s STCW and Merchant Mariner’s Credential. 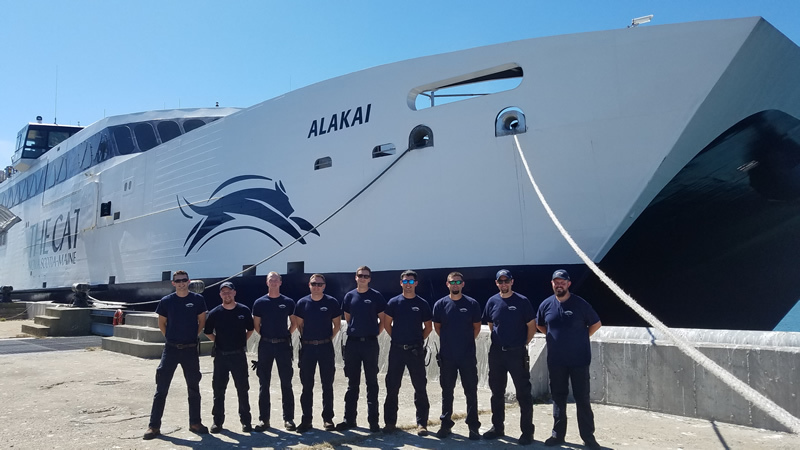 At the start of her inaugural season in June of 2016, the Alakai’s marine crew of 14 included four Maine Maritime alumni. Andrew Parker ’04, who was originally hired as the Chief Mate, was promoted to Captain midway through the first season and has been at the helm through each season since. Alakai’s first season was a success due to perseverance. Many believed getting the ship ready in time was not possible given her distressed condition, while others were skeptical there was time for a marketing campaign that would yield adequate ticket sales. 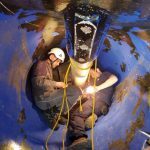 But as the company and crew faced challenge after challenge, they continually worked together to overcome obstacles, and met financial goals without any mechanical downtime. Casey Hawkins ’11 is First Assistant on the CAT. 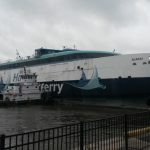 He joined the vessel just after she was towed to South Carolina before the first season, returning to a seafaring career after several years working in a biomass power plant in Jonesboro, Maine. Due to Maine’s winter weather and decrease in tourism traffic, Alakai returns to Detyens Shipyard each winter for maintenance, repair, and improvement. Staff is reduced to six marine department crew members, typically working a 28-day-on/28-day-off schedule. 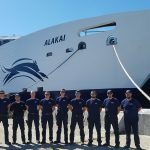 Alakai’s first full off-season period included a comprehensive replacement of every cylinder head on her four MTU 20V8000 series engines due to an improved design implemented by the manufacturer. Eighty cylinders total, it required nearly two months to complete. There was a great deal of anticipation entering 2017, but then an engine failure early in the season presented a major challenge. 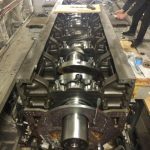 With repairs not possible during operations, the decision was made to finish the season with the remaining three engines and alter the schedule to accommodate accordingly. 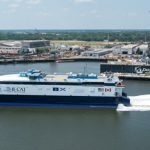 Although some perceived this as a heavy blow to the service, the majority of passengers, employees, and the public who witnessed the resiliency of BFL and the crew overcome this enormous challenge gave then confidence the CAT would prevail. And it did. 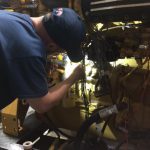 After a six-month rebuild to the damaged engine, which included a total crankshaft replacement, Alakai underwent an intensive sea trial at full power capacity and was ready to embark on her third season in the Gulf of Maine. This year’s operation brought aboard two Maine Maritime cadets, as well as three alumni from the class of 2018, less than two weeks after graduation. 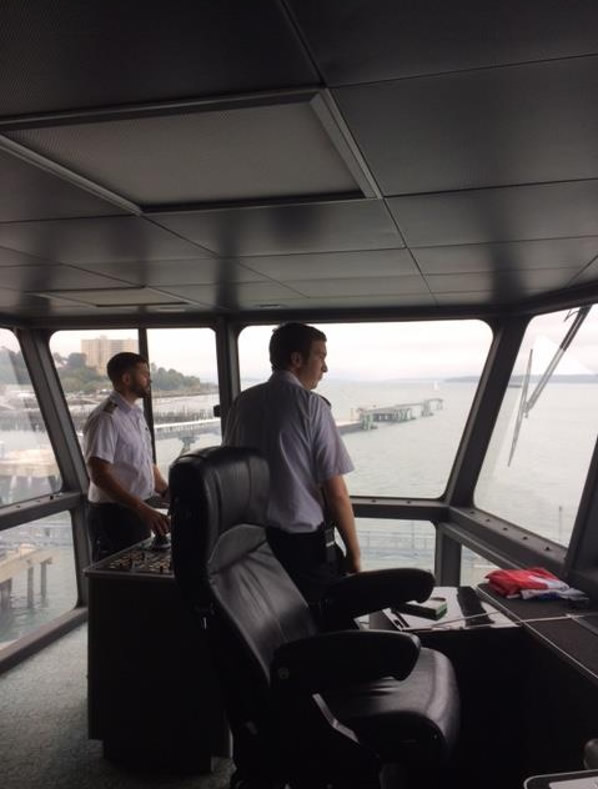 “My experience onboard Alakai provided great experience,” says Madison Barry, class of 2020, who completed her 90-day cadet shipping program on Alakai. “I was able to grow as a prospective professional because of the teaching and leadership skills I learned from the crew and officers.” Some of her daily routine included navigational watch, line handling, loading and off-loading vehicles, and assisting in creating an inviting passenger experience. All nine of the CAT’s MMA alumni. From L to R, AB Mark Harper ’18, QMED/Asst. Eng Matt Violette ’18, AB Truman Slocum ’18, AB John O’Keefe ’09, 2/M Malcolm Faux ’15, C/M Will Cunningham ’12, Capt. Andrew Parker ’04, C/E Jacob Turgeon ’02, 1A/E Casey Hawkins ’11. Trenton Bouchard, also class of ’20, joined Alakai as an engine cadet. 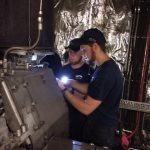 Bouchard was exposed to an array of operations and troubleshooting scenarios and was able to work closely with the vessels’ electronics technician, as well as the engineering officers. 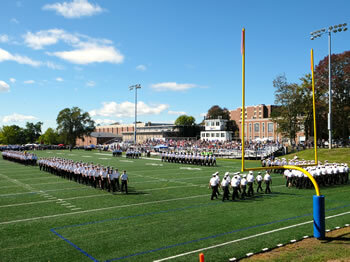 “During my cadet shipping experience, I was warmly welcomed by the crew, many of whom are Maine Maritime alumni. 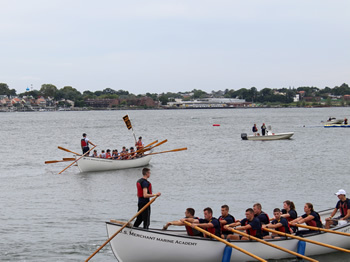 Other MMA alumni include AB Mark Harper ’18, AB John O’Keefe ’09, Second Mate Malcolm Faux ’15, and Chief Mate Will Cunningham ’12, who served during the 2018 season, in which Alakai carried more than 50,000 passengers. In recent months, BFL has made significant progress in the potential reintroduction of the fast-ferry route between Yarmouth and Bar Harbor. Alakai would fulfill this service, reducing the duration of a round trip to about 3.5 hours in comparison to its current route to Portland (5.5-6 hours). Alakai as Bay Ferries assumed operation in April 2016. It was towed from Philadelphia to Charleston and entered service eight weeks later. The Alakai departs Detyens Shipyard in North Charleston, South Carolina after a mere eight weeks of repair, renewal and recertification to begin service from Yarmouth, Nova Scotia to Portland, Maine. The CAT enters Yarmouth, Harbor during the first days of her inaugural season in 2016. Capt. Andrew Parker ‘04 and 2/M Malcolm Faux ’15 maneuvering out of Portland Harbor. AB Mark Harper ’18 assumes lookout as 2/M Malcolm Faux and Capt. Andrew Parker navigate the ship out of Portland, Maine. 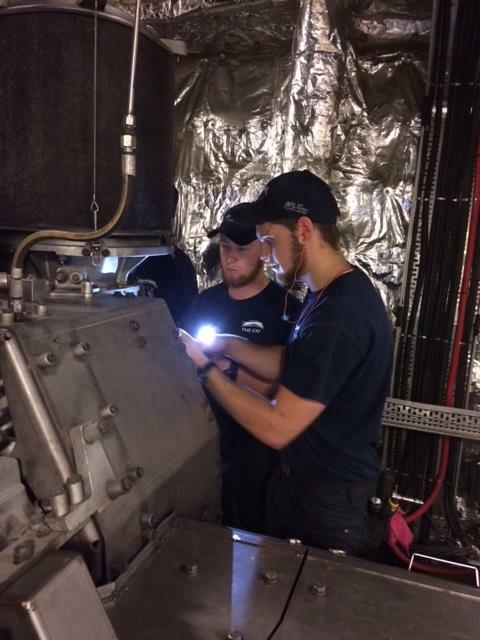 Engine cadet Trenton Bouchard ’20 assists QMED Matt Violette ’18 on a main engine turbo charger. 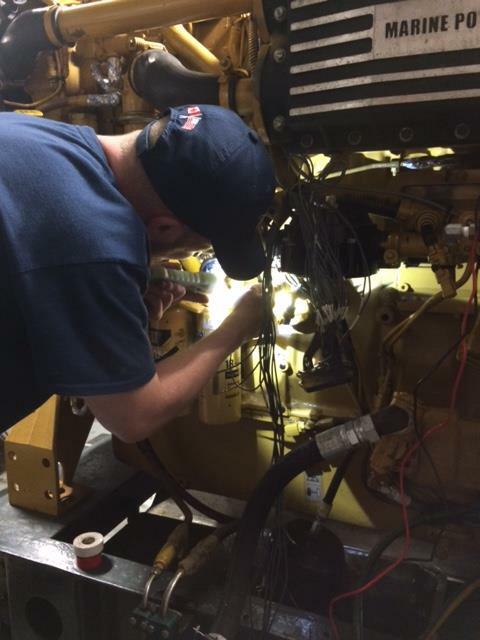 QMED/Assistant Engineer Matt Violette ’18 troubleshoots a diesel gen set while underway. 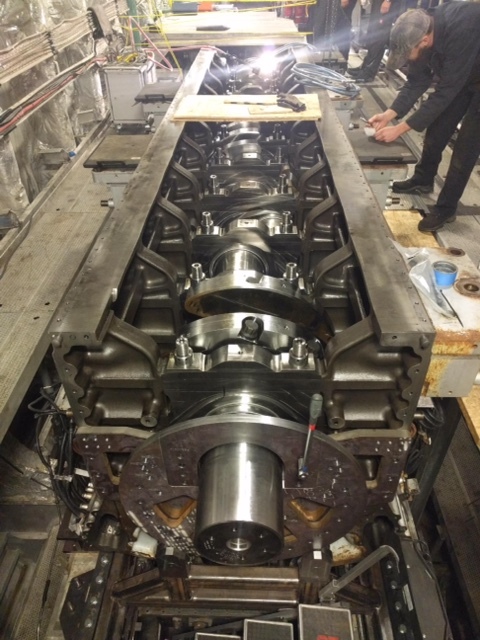 One of the Alakai’s main engines inverted to remove and replace the crankshaft after a bearing failure. She is powered by four MTU 20V8000 diesels rated at 11,000 hp each. 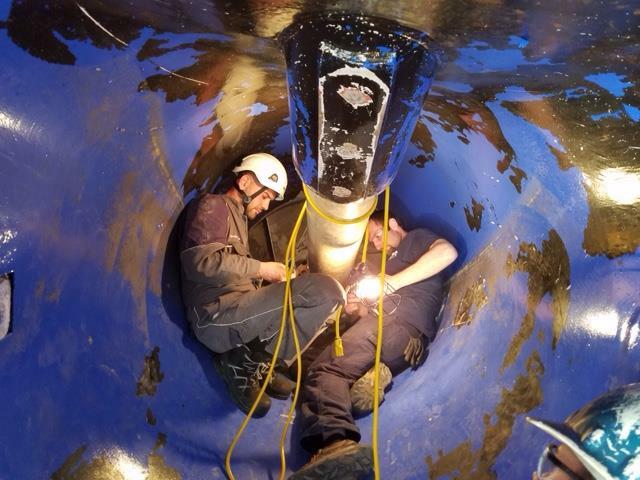 Chief Engineer Jacob Turgeon and Rolls Royce Field Representative inspecting one of four of Alakai’s impeller shafts. All nine of the CAT’s MMA alumni. From left to right: AB Mark Harper ’18, QMED/Asst. Eng Matt Violette ’18, AB Truman Slocum ’18, AB John O’Keefe ’09, 2/M Malcolm Faux ’15, C/M Will Cunningham ’12, Capt. Andrew Parker ’04, C/E Jacob Turgeon ’02, 1A/E Casey Hawkins ‘11. I think you may find this article interesting - "CAT on the Run"
1 Comment on "CAT on the Run"
what you do! Leaving your families for weeks at a time can’t be easy especially with little ones left behind. May God keep you safe always and return you home to your loved ones….